It's not just better crops that will feed the world - it's better microbes. They are not farmers, but they are working in the name of farmers everywhere. Under their white lab coats their hearts beat with a mission to unlock the secrets of the soil – making the work of farmers a little lighter, increasing the productivity of every field and reducing the costly inputs that stretch farmers’ profits as thin as a wire. Linda Kinkel of the University of Minnesota’s Department of Plant Pathology was one of the delegates at ASM’s colloquium in December 2012, where innovators from science, agribusiness and the USDA spent two days sharing their research and discussing solutions to the most pressing problems in agriculture. Microbiologists have thoroughly documented instances where bacteria, fungi, nematodes – even viruses – have formed mutually beneficial associations with food plants, improving their ability to absorb nutrients and resist drought, disease and pests. Microbes can enable plants to better tolerate extreme temperature fluctuations, saline soils and other challenges of a changing climate. There is even evidence that microbes contribute to the finely-tuned flavors of top-quality produce, a phenomenon observed in strawberries in particular. “But we’re only at the tip of the iceberg,” says Kinkel. Statements such as, “There are 10 to the 6th fungal organisms in a gram of soil!” and, “This bacterial biofilm has tremendous communication properties!” are breakroom banter among microbiologists, but what does it all mean for farmers? The answers reach back into the millennial past of agriculture, back to the dawn of life on earth. Whenever a seed germinates in the wild or a crop is planted by a farmer, the microbial community that helps that species to grow and thrive is mobilized. Chemical signals enter the soil via the exudates of the plant and a symphony of underground activity commences. Genetic information is exchanged; the various microbial players assume their positions on the tissues of the plant; often, one microbe colonizes another, providing a service that helps the first microbe to assist the plant whose roots it is embedded in. Though this elaborate dance takes place without any input from humans, we have been tinkering with it for a long time. For example, the process of nitrogen fixation in plants of the legume family (which includes beans, peas, peanuts and many other crop plants) is one of the little bacterial miracles that makes our planet habitable. Anyone who has ever observed the roots of a legume knows that they are covered in strange white or pinkish growths, about the size of ants, which appear to be an infection of some sort. Undoubtedly, ancient farmers had an intuitive understanding that these warty protuberances had something to do with the noticeable ability of legumes to improve the soil, but it wasn’t until the late 19th century that the mystery began to unfold. While Louis Pasteur was discovering how to preserve milk and becoming famous as the father of microbiology, a relatively unknown colleague of his with a penchant for plants was making another discovery, of perhaps even greater historical importance. In 1888, Martinus Beijerinck, discovered that tiny bacteria called Rhizobia infect the roots of legumes, causing the swollen nodules. Rather than an infection that weakens the plant, the nodules are the fertilizer factories of the plant kingdom, disassembling atmospheric nitrogen – which plants are unable to use – and refashioning it in a soluble, plant-friendly form. 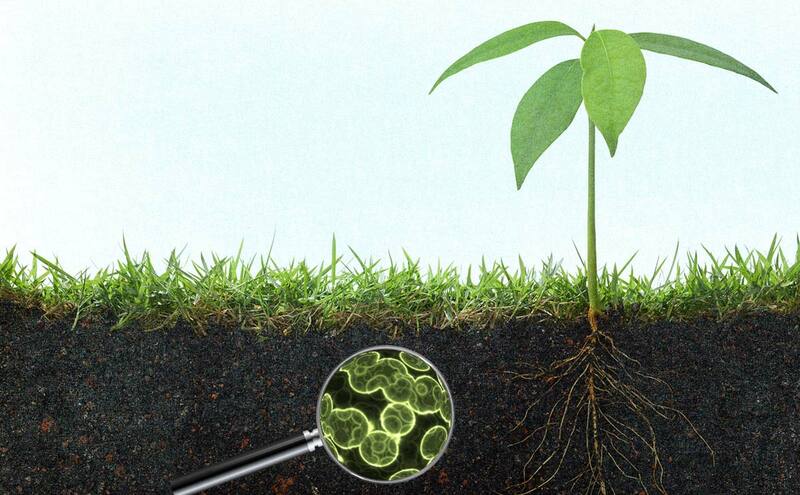 Rhizobia are key ingredients of the earth’s verdancy and harnessing the bacteria to improve soil fertility has long been one of the cornerstones of sustainable agriculture. Yet, modern day microbiologists are now aware of scores of other equally profound plant-microbe interactions, discoveries they believe will have a big impact as human populations continue to soar on a planet of finite resources. In her lab at the university, Kinkel experiments with antibiotic bacteria that suppress plant pathogens and tests various soil management strategies to see their effects on microbial communities. In Colombia, microbiologists have learned to propagate a fungus that colonizes cassava plants and increases yields up to 20 percent. Its hyphae – the tiny tentacles of fungi – extend far beyond the roots of the cassava to unlock phosphorus, nitrogen and sulfur in the soil and siphon it back to their host, like an IV of liquid fertilizer. Though microbiologists can coerce soil to produce extraordinary plant growth in their labs and test plots, transferring the results to everyday agricultural practices is not a straightforward process. The 26 experts from around the world convened at the ASM colloquium concluded their discussions with a bold goal for the future of agriculture: They’ve challenged themselves to bring about a 20 percent increase in global food production and a 20 percent decrease in fertilizer and pesticide use over the next 20 years. With an indomitable belief that science will do its part to make this dream a reality, the scientists are looking to their corporate and regulatory counterparts to build a pipeline of information to farmers. They’re hoping that top-down investments in research and technology will meet directly with grassroots changes in the culture of farming – without all the snake oil-vending agribusiness interests in the middle. Ultimately, they envision a future where farmers again trust in the unseen forces of the soil – instead of the fertilizer shed – for answers to their challenges.